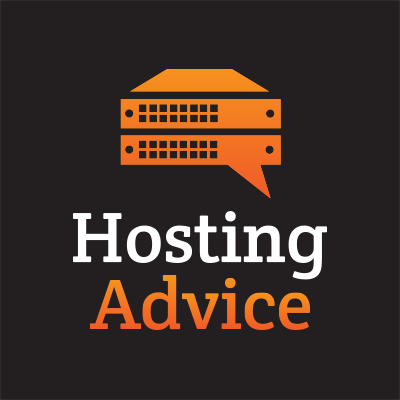 Today we are hosting a guest article written by Jacob Nicholson from HostingAdvice. Jacob had agreed to re-post part of his article on our blog platform. You can read the full article here. If you haven't heard about HostAdvice they offer how-to's, news, and reviews on hosting platforms. “Our attitude is we want to keep the stack with as few moving parts as possible, so it’s manageable and we can actually understand it more than just bringing anything in,” Sajadi said. On the internal side, they use Sinatra and Ruby on Rails for the public web. They also leverage MySQL, Cassandra and InfluxDB as part of their database strategy and RabbitMQ for most of their asynchronous application messaging. Their infrastructure is built around the same cloud services they deploy to (primarily Amazon, RackSpace, Digital Ocean and Linode). They mostly develop on Mac and have begun migrating to Docker containers, which they also now support deploying of. Cloud 66 has a lot of code for using cloud provider’s APIs to spin up servers, getting access to these servers and setting up SSH key management. During the development stage, a lot of focus was on security to ensure all customer data was safe. Cloud 66 also coded in support for pulling from the Git protocol, so if you have your own Git repo, you can use that. They also leverage things such as a database.yml file to figure our dependencies during their code analyzing stage. At the end of the analyzing, you end up with a recipe of the steps needed to deploy everything. I was impressed how easy the cloud deployment process went. I hopped on GitHub, found a good Ruby on Rails application and then plugged that URL into Cloud 66’s dashboard. It went off analyzing the code to figure out what dependencies were needed, such as a Redis database and any Ruby modules. 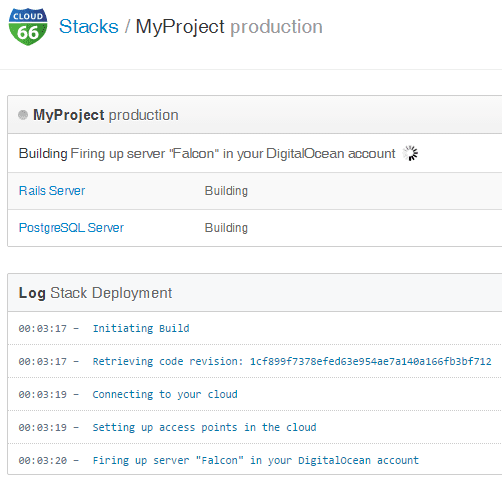 It then connected to my Digital Ocean’s account, spun up a new server and began provisioning all these requirements for my app. There is a balance in making things seem magical in this black box type environment, and Cloud 66 wants developers to still know what’s going on, presenting itself as a convenient option for cloud deployments. Cloud 66 see themselves as Junior Ops just hired for a company, so they want you to know they know their stuff and what’s going on. As you trust the process more, you just let the magic take over. One of Cloud 66’s big goals for the year was to launch a new website. Funny enough, their new site went live the same day as our interview, so that was cool to get to see they’re already making great strides in 2015. Another one of Cloud 66’s big goals for 2015 is making the use of Docker easier. There is a lot of talking going on about what containers are and what they’re good for. They’ve spoken with a lot of clients who vaguely think the concept is neat, but they haven’t invested the time to really understand the advantages. When Cloud 66 asked clients if they’ve experienced certain problems, they say yes. When they tell them containers could help fix that problem, the clients are a bit more interested. But when you bring new technology like containers into the mix, you start to open up other problems. How are you going to bring it into your workflow? How are you going to train your developers to work with this? Cloud 66 would like to simplify the process of working with containers. Developers shouldn’t have to know everything about them, but they could still leverage their power. Another goal for 2015 is a bigger push into the enterprise market, which means more managed components. This would be for companies that aren’t focused on infrastructure for a particular application but would still like infrastructure management components that are easy to manage. I’m really glad I heard about Cloud 66. 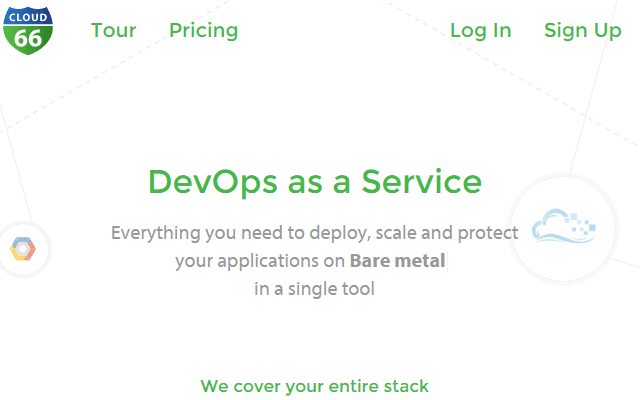 They provide an amazing service any developer could fall in love with. With even more planned, it will be exciting to see what other features they add. I really appreciate Khash taking time out of his busy day to answer my questions. I could tell he’s really passionate about helping people solve cloud deployment woes. If you’re thinking about jumping on the cloud, but don’t know what route to take, Cloud 66, baby! You can find more awesome articles on HostingAdvice Blog!